We believe that education is the road to peace. StandWithUs is dedicated to informing the public about Israel and to combating the extremism and anti-Semitism that often distorts the issues. We believe that knowledge of the facts will correct common prejudices about the Arab-Israeli conflict, and will promote discussions and policies that can help promote peace in the region. Through print materials, speakers, programs, conferences, missions to Israel, campaigns, social media and internet resources, we ensure that the story of Israel’s achievements and ongoing challenges is told on campuses and in communities around the world. 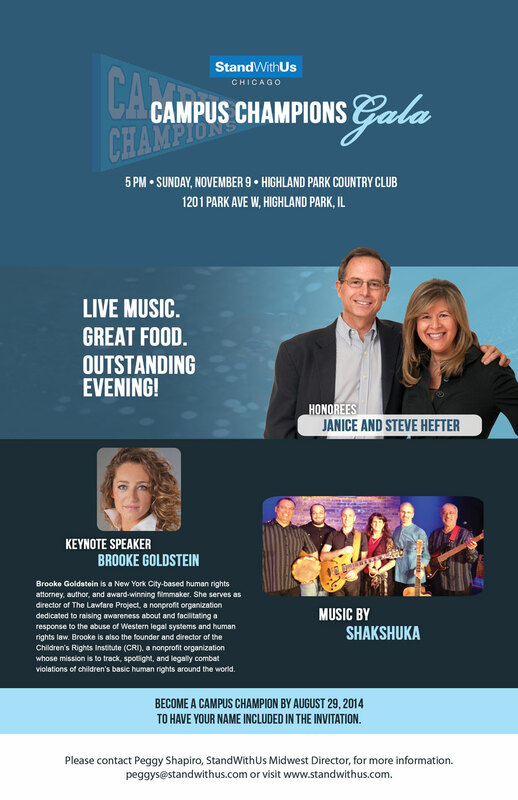 This entry was posted in Israel & Middle East, Jewish and tagged Brooke Goldstein, Campus Champions Gala, Janice Hefter, Shakshuka, StandWithUs, Steve Hefter. Bookmark the permalink.